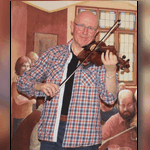 Tom McConville the Newcastle fiddler is well loved up and down the country. With his melodious voice, easy manner and dry sense of humour he is a joy to listen to. His fiddle playing is in a league of its own and can quite take your breath away. Come early as he has lots of fans in Brum.